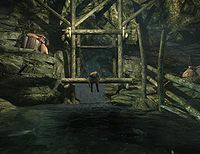 Stony Creek Cave is a small cave located in the southeastern corner of Eastmarch that is occupied by bandits. 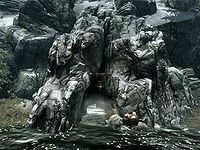 The exterior of Stony Creek Cave is marked by a small pond in a snowy area of Eastmarch just north of Ansilvund and south of the Eastmarch Imperial Camp. There is a docked boat at the pond and harvestable clams in the middle of the pond bed. The cave entrance is to the east of the pier, and is noticeable by the rising steam. There are some Nordic barnacle clusters around the entrance walls. Find Shahvee's Amulet of Zenithar: Do a favor by retrieving an item from a bandit hideout. The entrance to the cave is by a small lake with a jetty and rowing boat to the west. There is a stack of crates with three food sacks to the right of the entrance and several Nordic barnacle clusters on the rock walls on either side of the entrance. A stream flows out of the cave making the entrance partially flooded and feeding the lake. The cave itself consists of the stream that fills the lake at the entrance and has two main areas. The first thing you see upon entering is a dead Breton drooped over a beam in front of the stream. The water here contains some salmon and two skeletons. The path is made up of some planks that extend into the water to the right-hand side of the water. After turning the first corner, the air appears to be shimmering; this is flammable gas and can be ignited with flames or a torch (just having a flame spell equipped is enough to set it off). The gas extends almost to the end chamber and partway into the side chamber, and if ignited will deal significant damage to any enemies caught in the blast, but they will be on high alert after this, making any remaining stealth approach very hard. The tunnel is patrolled by two bandits. The side room is to the right shortly before the tunnel takes a left turn. There is a bandit on lookout here on high alert; he is always sitting on the edge of the planks, beside a lantern, even though a chair is available for use. At the bottom of the planks is a skeleton and behind the bandit is a medium coin purse, an imp stool, and a Namira's Rot fungi. To the left before the fungi and between the candles, the tunnel continues on to the side room. Halfway through the tunnel is a tripwire which triggers a swing mace trap hanging from the ceiling, but so long as you are not sprinting, this will not hit you. This room contains the boss bandit who carries Treasure Map X and, upon his death, the cave will be marked Cleared on the map. With Ruin's Edge installed, the boss will be carrying the Ruin's Edge bow the first time you kill him. The boss room also contains an alchemy lab with a bowl of ectoplasm on it. To the left of that is a table with a bowl of some deathbell flowers and an orange dartwing on top. To the right is a bench with an unusual gem, a random poison, a bowl of fire salts, and the Illusion skill book Mystery of Talara, Part 4. In the corner is the unlocked boss chest which contains Finn's Lute and other random loot from the leveled lists. Growing around the room are two bleeding crown, one white cap, and one Namira's Rot fungi. Returning to the tunnel and going north, up one side is growing a Namira's Rot, which is just past the end of the gas. There is one last bandit in the large chamber, mining one of the two moonstone ore veins that are marked by lanterns. There is also an apprentice-locked chest near the ore vein to the left, a couple more skeletons that can be looted and several food sacks in this chamber. There is also a waterfall falling from a ledge on the rear wall, this is the exit from Kagrenzel. The creek feeding the waterfall in the mining chamber can be used to access Kagrenzel by climbing and jumping up the cliff and/or using the Whirlwind Sprint shout. Some radiant quests may point to Stony Creek Cave when the actual objective is in Kagrenzel, located within a short distance after entering it by using the technique above. There is a corundum ore vein a short distance directly east of the cave, and an iron ore vein slightly northwest of that. The cave reappears in Legends. It is advised not to take Finn's Lute until the quest Finn's Lute has been started, as it will not be removed from your inventory if taken beforehand. The chief bandit carrying the treasure map may not appear. ? Forcing the dungeon to respawn, either through taking one of the quests that require a boss bandit or waiting 30 days should make one spawn. This page was last modified on 30 January 2018, at 20:48.